Brian is home from camp and just like last year, he was wearing the same clothes he went in. 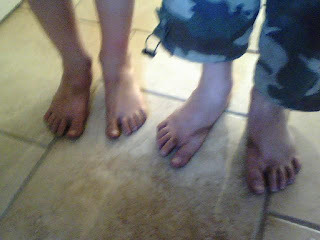 So gross...here are Nico and Brian's feet. Two showers later, they were almost clean. This morning in the car on the way to church. First time we have all been together, to church, since May. They look thrilled, don't they?